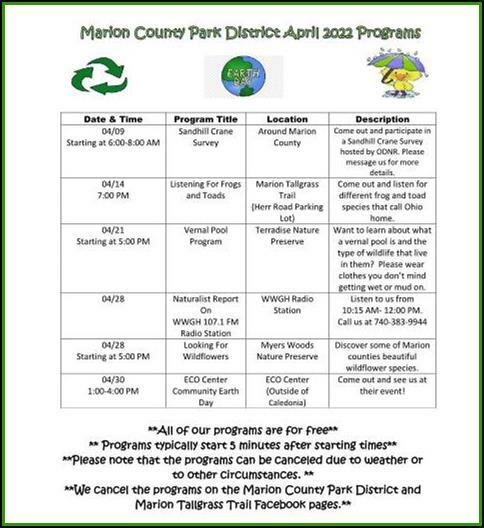 The Marion County Park District, in north central Ohio, includes five beautiful parks. Marion Tallgrass Trail: The paved multi-use recreational trail is 12.44 miles long, reaching the Hardin County line. Marion Community Foundation Lake: Guests can fish in this 53 acre lake, located near Herr Road, and non-motorized boating is permitted, with certain restrictions..
Terradise Nature Preserve, in eastern Marion County, offers a shelter house, hiking trails, geocaching, and peaceful reflection near the beautiful Olentangy River. Greenspur, north of Prospect, features woods, a small wetland pond, and will contain a picnic shelter. Myers Woods, near the Killdeer Plains Wildlife area in northern Marion County, is a wonderful place to take a short stroll in the quiet woods. Caledonia Nature Preserve is a beautiful streamside forest near the village of Caledonia. Volunteer, and make a difference! Join the Friends of Prairie Parks. Please consider a donation to help us maintain and enhance our beautiful rail-trail. Click here for sponsorship opportunities. BUY A BRICK, Help maintain the Tallgrass Trail!More information here. Donate here to help maintain the Tallgrass Trail.